Announcement I specialize in handmade rope rugs, doormats, bath mats and other rope home decor items. All my creations are designed by me. They are also handcrafted by me from my home in New York. Many are nautical and rustic theme for outdoors lover such as myself. I specialize in handmade rope rugs, doormats, bath mats and other rope home decor items. All my creations are designed by me. They are also handcrafted by me from my home in New York. Many are nautical and rustic theme for outdoors lover such as myself. Working on a new rug. Almost finished with a rope rug creation. Sometimes I work with a huge hook and rope, and sometimes with tiny hook and fine thread. Who am I and why do I do what I do? Gentle breeze tangling my hair. Warm sun coating my skin. Cool water rushing between my toes sweeping away the sand from underneath my feet. The birds are composing their symphony in a distance. I'm filled with peace and joy. I'm content. It takes a moment to come back to reality. “Yes”, I answer. I hear soft and gentle footsteps rushing to my bed and suddenly stop. Slowly, I open my eyes and I see my 5-year-old's face 2 inches from mine – big smile and messy hair. She climbs onto my bed, and slips under the warm blanket for few minutes of snuggles. I design my creations to awaken these feelings of piece and joy in those who look at them, touch them and to say frankly, step on them. The rugs I create are a peace of art that is meant to be experienced. When I step out of the shower and onto the rope bathmat, the memories of a beautiful day on a boat come to my mind. When I come home and see the jute mat welcoming me to my house, I think of the day I spent with my family camping in the woods. My name is Magda Marsh. My passion for crafting started when I was maybe 9 or 10 years old and my mom introduced me to fine thread crocheting. I spent many hours creating very detailed and delicate doilies. Over the years, I've done many different crafts, but crocheting was the one craft that I always came back to because it gave me so much pleasure. Yet, my life took me in a totally different direction. I went to college to study business, which quickly changed into mathematics and even quicker into computer science. With my Masters degree in computer science, a well paying job as a software engineer, and starting a beautiful family, my life appeared to be exactly what I wanted. But then I started to wonder. What if there is more out there for me. Soon, pieces started to fall into place. 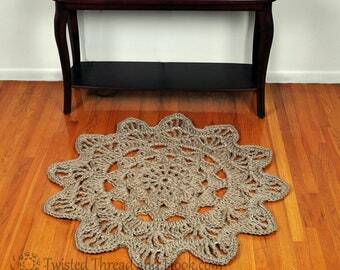 I love crocheting, a very old craft, but I also like to discover new things. I love kayaking, camping and sailing (I spent every summer vacation since I was in diapers on a sailboat), but I don't have enough free time or money to enjoy these activities on daily basis. That's when Twisted Thread and Hook was born. After a few months of trial and error, I finally found what brings joy to me and others at the same time. I started with cotton rope, the same exact one used in sailing, to create large rugs and bath mats. 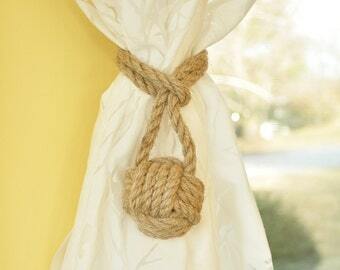 Then I discovered jute rope – great, rough texture with a rustic feel. My mind was full of new ideas. Rope on the windows as curtain tiebacks, on the tables as coasters and on the shelves as baskets... Ok, so I'm a bit rope crazy now, but I'm also smiling a very big smile :). My inspiration comes from all around me at the most unexpected times. Sometimes, I take an idea and make a prototype with a thinner yarn which is easier to play around with. Once I like the small version, I recreate it with rope. I don't fully know the final look until it's all finished. During the whole process I have my notepad with me writing down all the stitches and steps so I remember how to make it again. Other times, I just pick up the rope and see where it leads me. I may have some technique or new stitch in mind that I want to work into the pattern. I crochet a few rows, I unravel some. I tweak and remake. I change my mind a lot, I mean A LOT, until finally, it all comes together and I truly love what I created. And then I ask my kids how they like it and they always give me the most honest opinion, of course - “I love it” with big smiles and admiration. Thank you for visiting Twisted Thread and Hook! All pieces are created by hand, so no two items are identical. That’s the beauty of handmade. Please allow for slight variances from what is shown on the product photos.